Here’s what’s up in the world of TV for Monday, July 18. All times are Eastern. Steven Universe (Cartoon Network, 7 p.m.): Steven Universe is back to bring sunshine and rainbows to the worlds of both #PeakTV and TV Club. 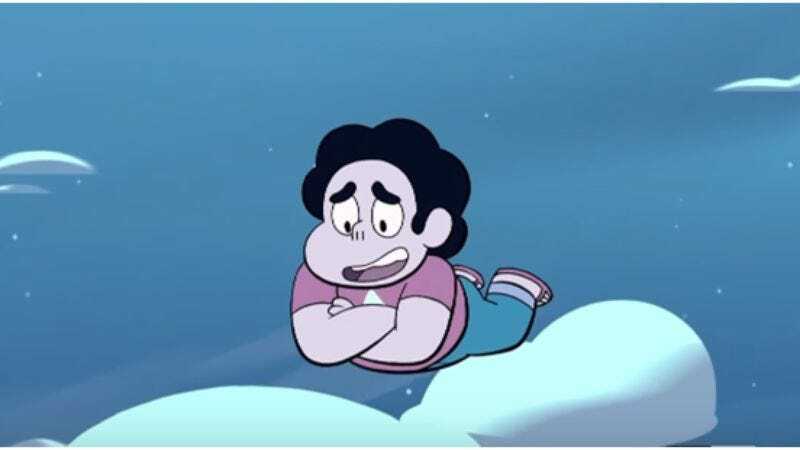 First up, it’s “Steven Floats.” Fifteen minutes isn’t enough time for an animated shot-for-shot remake of Hope Floats (though if Rebecca Sugar likes that idea, she knows where to find your friendly neighborhood What’s On Tonight contributor), so here’s what actually happens in the episode: “Steven jumps for joy, but jumps too high.” Then, in “Drop Beat Dad” (get it? ): Well, there’s no synopsis for that one. So let your imagination run wild, it’s what Steven would want. Plus, Eric Thurm’s review should settle it all. 12 Monkeys (Syfy, 9 p.m.): 12 Monkeys ends its second season with a “Memory Of Tomorrow.” What exactly does that mean? “As Cole and Railly try to find peace living in the past, they encounter a mysterious woman with apocalyptic visions of the future, who tells Cole that his work isn’t done and he must do the unthinkable to save the world.” Cole’s kind of done a lot of “the unthinkable to save the world” at this point, so what’s going to be so bad this time, huh? At least we won’t have to worry too much about any potential cliffhanger woes—the series has been renewed for a much-deserved third season. Angie Tribeca (TBS, 9 p.m.): In “Boyz II Dead” (great title, right? ): “Geils and Tanner investigate the mysterious death of a reunited boy band member, while Tribeca finally meets with Sgt. Pepper. Why? Seemingly, he’s connected to Mayhem Global, but what is Mayhem Global and why do they keep bringing it up?” These are all really great questions, Angie Tribeca. We’re sure you’ll answer them in a satisfactory, logical fashion. Also: Bring on the reunited boy band. Open Your Eyes (HBO, 7:30 p.m.): Tonight’s HBO documentary is Irene Taylor Brodsky’s Open Your Eyes: “Living under the Himalayan sun, their eyes have slowly gone milky white. Manisara and Durga have cataracts, and their mountain home in Nepal has become a warren of darkness. Shot over three days, Open Your Eyes follows their extraordinary journey down the mountain for a chance to see again.” This one sounds like a tearjerker, so you should definitely watch it after Steven Universe. You know, to keep the tears going from one program to another. T.I. & Tiny: The Family Hustle (VH1, 9 p.m.): T.I.’s surprisingly delightful family reality series returns for… more of its fifth season (which should technically be its sixth season) tonight with “All About Domani”: “Domani enlists the help of Tiny and his siblings to showcase his talents as an entertainer.” That really is “All About Domani.” Doesn’t explain why this isn’t just season six—the last episode to air this season, episode 11, aired last August—but we don’t make the rules. T.I. and Tiny do. That’s So Raven, “Boyz ’N Commotion” (Disney Channel App): Angie Tribeca shouldn’t get to have all the boy band fun: And it won’t if you watch this episode of That’s So Raven. The Boyz ’N Motion deserve to be remembered, if only for the fact that Ryan Hansen is one of said Boyz. Singing and dancing Ryan Hansen is the best Ryan Hansen.